The working knowledge of earth's fundamental life support system living organisms and how they operate is essential for a clear understanding of our environment. Environmental problems and their solutions occur at the intersection of natural systems and the human systems that manipulate the natural world. 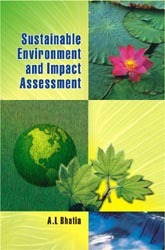 Present book “Sustainable Environment and Impact Assessment” deals with the sustainability of environment with the integrated approach taking into consideration of most of the possible human systems that affect nature, like food and agriculture, population growth, urbanization, environmental health, resource economics, and policy. Just by emphasizing purely natural systems, readers can never understand the management of environment without understanding the cultural, economic, and political forces that shape our decisions to sustaining the environment. Present book presents various dimensions on sustainability and the impact of human systems especially the ones which have been touched sparingly earlier due to no clarity like Humankind’s Security and Shift to Sustainable Practices, Ecological Integrity Global Ethics for a Sustainable Environment, Biodiversity, Ecotourism, and Medicinal Plants for Sustainable, Recent Perspectives of Renewable Energy, Bioenvironmental Approach for Vector Control etc. However, readers will have the basic knowledge of sustainability and various designs for impact assessments in chapters like Environment and Human Activities, Sustainability of the Environment, Pollutants, Environmental Impact Assessment, Health and Environmental Problems, Conservation and Management of Natural Resources etc. The book offers a rich collection of peer reviewed many articles, for which editor had provided some context at the beginning of preparation of chapters. Bringing out and edited by an internationally renowned scientist and visionary, the book will also provide an invaluable introduction to the sustainability of living environment for all areas of study, catering to the need of all expert policy-makers as well as students, researchers, environmentalists and would prove an asset to any library.